Purple Carrot Reviews - Is it a Scam or Legit? Purple Carrot is a plant-based meal subscription service that delivers ingredients for gourmet meals that are designed to appeal to both vegans and omnivores. Purple Carrot is a plant-based meal subscription service that delivers recipes and ingredients for healthy vegan meals across the continental United States. The company states that each meal serving contains between 500 and 800 calories and that they provide a blend of plant-based healthy fats, protein and complex carbohydrates from nuts, seeds, legumes, fruits, and vegetables. According to the company website, Purple Carrot founder and CEO Andy Levitt was inspired to create the company after a Crohn’s disease diagnosis at 40. He found that standard medicine did little to improve his chronic pain, but that following a plant-based diet made a difference. This discovery, paired with a deepening understanding of the damaging environmental effects of consuming meat, led him to develop Purple Carrot as a vegan meal kit service. Though all Purple Carrot meals are certified vegan, the company strives to appeal to all kinds of eaters. According to a Forbes interview with founder Levitt, 82 percent of the company’s subscribers are omnivores. Does Purple Carrot stand out in the crowded meal-kit market? This article will help you decide whether the company is worth your commitment. How Does a Purple Carrot Subscription Work? At the time of writing, Purple Carrot offers their meals on a weekly subscription basis. Customers can choose between four plans- Quick and Easy, High Protein, Chef’s Choice and TB12- or mix and match meals from the first three (the TB12 meals cost more and can’t be combined with other plans). Each weekly plan provides you with three recipes of two servings each. The site offers a rotating menu of six meal options each week for the first three plans and a separate menu for TB12. Subscribers can select their meals or let the company send them automatically based on their chosen program. At the time of writing, the weekly meal options included a kimchi quesadilla, roasted vegetable hummus bowl, rigatoni arrabiata, mushroom bourguignon, a winter salad, and white lentil risotto. Purple Carrot says online that their order deadline is the Tuesday morning of the week before delivery, and any account changes or meal swaps must be completed before then. Though the company states that they ship across the continental United States, the website specifies that you need to contact them directly at hello@thepurplecarrot.com to determine whether they deliver to your area. Every Purple Carrot order arrives within a box that includes every ingredient besides a few basic staples such as oil, salt, and pepper. The company states that they bundle the ingredients for recipes together to save you time during the prep stage, and each box comes with full page recipe cards with color photos and step-by-step instructions for cooking the meals. The company also states that they strive to prioritize sustainable packaging by offering online video instructions for “upcycling” it in creative ways. How Much Does Purple Carrot Cost? At the time of writing, Purple Carrot offered their three base meal plans for $72 per week, which comes to $12 per serving (three meals of two servings each). The TB12 plan costs $78, or $13 per serving. Signing up for Purple Carrot enrolls you automatically in their weekly subscription program, which you can pause or cancel without cost at any time from your account. It’s also possible to sign up for a gift subscription at the same pricing for a predetermined amount of time that won’t renew after it expires. Is Purple Carrot Safe for Allergy Sufferers? According to their website, all Purple Carrot meals are processed in facilities that also handle wheat, gluten, walnuts, peanuts, and other nut products, meaning that there is a risk of cross-contamination between meals. Likewise, they stated at the time of writing that they aren’t able to accommodate ingredient substitutions for their meals. If you have further questions about the company or their nutritional information, you can contact them directly at hello@thepurplecarrot.com or by phone at 1-857-703-8188. What are Purple Carrot Recipe Options? As we mentioned earlier, Purple Carrot offers three standard plans at the time of writing, as well as a premiere TB12 plan inspired by the diet of quarterback Tom Brady. Quick and Easy: This plan offers simple dishes that come together in thirty minutes or less and are designed to provide an unintimidating introduction to plant-based cooking. High Protein: Each of the meals in this plan packs at least 20g of protein per serving, and they contain filling ingredients like quinoa, tempeh, spinach, and kidney beans. Chef’s Choice: These meals are branded as gourmet options for experienced cooks to experiment with innovative, often internationally-inspired dishes. They are meant for cooking enthusiasts who want to improve their culinary repertoire of plant-based recipes. The Purple Carrot website tells us that the brand partnered with five-time Super Bowl champion Tom Brady in the summer of 2016 to develop a line of meals that offer peak plant-based nutrition for athletes. TB12 recipes, named after Brady’s twelve principles for healthy living, tend to be higher in calories and protein than the brand’s other meals. The meals are gluten-free and low in soy and refined sugar. The company states that all TB12 meals are either taken directly from plant-based meals that Tom and his family eat or are inspired by his overall nutritional guidelines. What Do Past Customers Think of Purple Carrot? To determine how previous customers feel about Purple Carrot reviews, we looked at the brand’s feedback on Yelp, as well as in-depth reviews on Business Insider, PC Mag, and Vogue. Overall, these comments showed that Purple Carrot subscribers were impressed with the variety and complexity of the meals they received. We noticed several comments saying that the menu was varied for a vegan diet, especially when compared to the predominately pasta-based options available from other subscription companies. Reviewers also liked that the ingredients for each meal were bagged together, which reduced confusion during prep time. However, this complexity meant some customers felt like the meals took too long to make, especially for weeknight dinners. Business Insider health writer Melia Robinson noted that one of her meals went bad before she found the time to make it. Similarly, we noticed numerous reviews on Yelp from customers who received spoiled vegetables or boxes that were missing crucial ingredients. Another negative we noticed was that the customers felt the boxes contained a lot of plastic, which seemingly went against the brand’s environmental principles. Overall, these reviews tell us that Purple Carrot has plenty of fans who are willing to stick with the company. Many users commented that they had been subscribed to the company for more than six months and had no interest in canceling. This is worth mentioning, as research from Fast Company reveals that customer retention is one of the biggest hurdles for meal prep companies. What Other Meal Kit Companies are Similar to Purple Carrot? Below is a chart of some of the ways that popular meal kit companies compare to Purple Carrot. It’s clear that Purple Carrot is on the expensive side when it comes to meal subscription kits. That makes sense, as it’s the only kit to offer plant-based meals exclusively, so the recipes likely contain more fresh produce than the other options. Purple Carrot is most similarly priced to Plated and Fresh Meal Plan, but the three companies differ on what they offer. Fresh Meal Plan meals come pre-assembled and only need to be heated. Plated and Purple Carrot meals, in contrast, come as raw ingredients and will take an estimated half hour or longer to produce. Regarding the options for customization, each of the plans we looked at allows customers to have some say over the meals they receive each month. Fresh Meal Plan has the most extensive variety, as they let subscribers select whether they are interested in traditional, paleo, vegetarian, ‘lean and mean,’ or keto meals. Crucially, subscribers can’t combine meals from multiple categories for their order. Like Purple Carrot, HelloFresh offers a vegetarian-friendly subscription option. This plan is $8.99 per serving, which is $3 less than Purple Carrot. However, HelloFresh offers just three meal options each week, which means that subscribers don’t have the opportunity to opt out of menu items they don’t like. Overall, this comparison shows us that Purple Carrot presents itself as a gourmet meal kit for plant-based eaters who aren’t afraid to spend some time in the kitchen. If you’d rather save money and sacrifice selection, or if you prefer receiving your meals premade, you might want to consider Hello Fresh or Fresh Meal Plan instead. Our View: Should You Try Purple Carrot? Putting these findings together, we think that Purple Carrot has positioned itself well as a plant-based meal kit option for foodies and those who want to become more confident in the kitchen. You probably won’t save time or money making these meals compared to relying on other meal kits (or even the grocery store! ), but the company gets points for providing an innovative menu with changing options each week. Past customer reviews show that Purple Carrot scores points for originality, though the recipes can be time-consuming. We also noted numerous comments from subscribers saying that they regularly dealt with missing or spoiled ingredients. 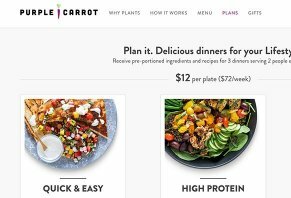 Like many meal plan companies, Purple Carrot has a seamless process for changing or canceling your subscription, though you need to commit at least a week before the predetermined shipping date to not be billed for another week. If you’re interested in experimenting with a meal subscription kit or want to learn how to make more plant-based meals, Purple Carrot is a company to consider. The meals are well-balanced nutritionally, and Tom Brady’s TB12 line promises to fuel even professional athletes on plants. There’s no promise you’ll make it to the super bowl, but Purple Carrot wants to help you feel like the star of your own kitchen. Write a Review for Purple Carrot!